The Partnership for Transparency Fund (PTF) concentrates its work in the healthcare sector of developing countries in two related areas: citizen monitoring and engagement. The projects PTF supports, led and implemented by local civil society organizations (CSOs), aim to improve the lives of poor people whose healthcare services are characterized by inefficiency, waste and corruption. The misappropriation of funds for health services, the theft of medicines, the distribution of out-of-date drugs and/or counterfeit products, plus extortion of ill people by healthcare providers, adds gravely to human misery. 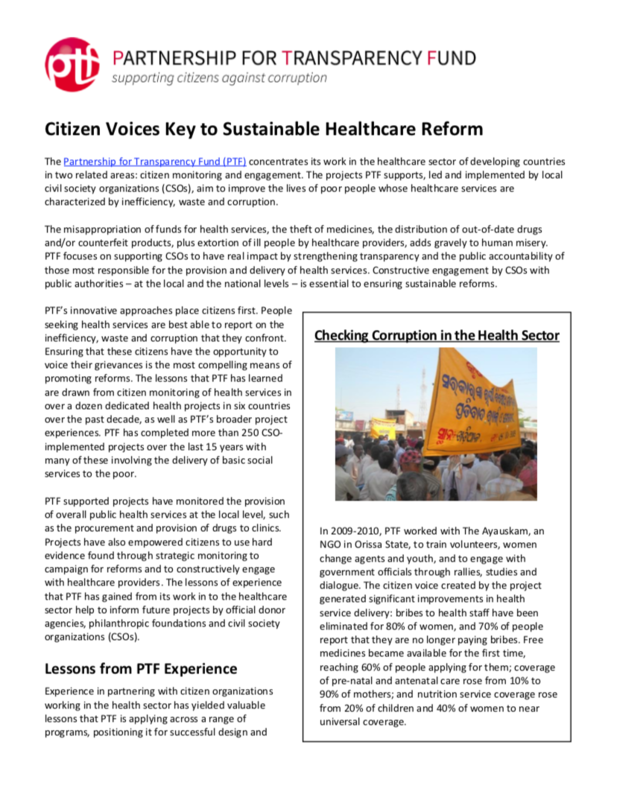 PTF focuses on supporting CSOs to have real impact by strengthening transparency and the public accountability of those most responsible for the provision and delivery of health services. Constructive engagement by CSOs with public authorities – at the local and the national levels – is essential to ensuring sustainable reforms. PTF’s innovative approaches place citizens first. People seeking health services are best able to report on the inefficiency, waste and corruption that they confront. Ensuring that these citizens have the opportunity to voice their grievances is the most compelling means of promoting reforms. The lessons that PTF has learned are drawn from citizen monitoring of health services in over a dozen dedicated health projects in six countries over the past decade, as well as PTF’s broader project experiences. PTF has completed more than 250 CSO- implemented projects over the last 15 years with many of these involving the delivery of basic social services to the poor.